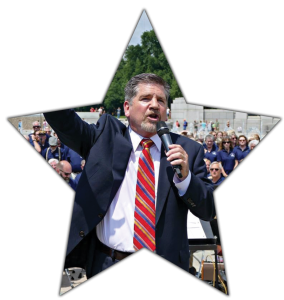 Randy Lind sings in front of the World War II memorial on Sun., May 27. 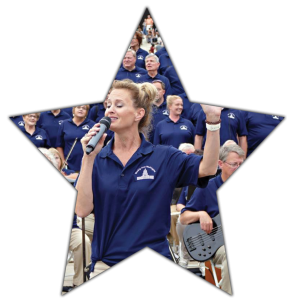 WASHINGTON—From May 25-30, Capitol Hill, the National Mall and many other significant locations rang out with the sound of more than 400 Oklahoma Baptist Singing Churchmen (SCM), Singing ChurchWomen (SCW) and the Oklahoma Baptist Symphony (OBS). ‘Worship over Washington’ was a complete success in the eyes of Randy Lind, Baptist General Convention of Oklahoma (BGCO) Worship and Music specialist. James Swain, BGCO Equipping Team leader echoed Lind’s praise of the three musical groups. Throughout the course of five days, SCM, SCW and OBS performed concerts at the legendary Kennedy Center for the Performing Arts, the Lincoln Memorial, the World War II (WWII) Memorial, inside the Rotunda of the United States Capitol building and at Immanuel Bible Church, where Vice President Mike Pence is a member. Swain pointed out that without the assistance of Oklahoma’s U.S. Senator, James Lankford, and Oklahoma Congressman Steve Russell, each Oklahoma Baptists, the groups would likely not have had the opportunity to perform in the Capitol building. A member of the Singing ChurchWomen sings a solo in front of the Lincoln Memorial. night, and they made it possible for us to visit and prayer-walk both the House of Representatives and the Senate Chambers,” Swain said. Oliver North spoke as a part of the proceedings of the ceremony at the Capitol Building. Perhaps one of the most important things the SCM, SCW and OBS accomplished while in the Nation’s Capital was not done during a performance, but offstage after most performances. The response to each performance was warm and welcomed by those who attended, whether they intentionally came to the concert or were passing by and decided to stay and take in the sounds of the more than 400 Oklahoma Baptists worshipping. 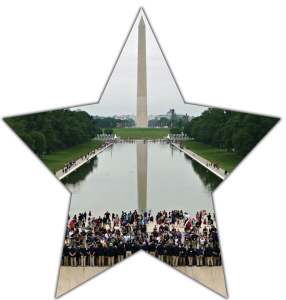 Spectators gather in front of the reflection pool and the Lincoln Memorial as the SCM, SCW and OBS perform facing the Washington Monument. “Many people were engaged in that song, including a lot of veterans. So many of them wrestle with some of the demons of their service and that song seemed to resonate with them well,” Swain said. Another notable experience for the musical groups was a trip to Arlington National Cemetery, where Lind, Swain, Brad Henderson, conductor of OBS and Bill Green, former BGCO senior associate executive director, laid a wreath on the Tomb of the Unknown Solider from Oklahoma Baptists. Something special about a few SCM is that they are war veterans themselves. Morris Neighbors is a SCM and WWII veteran. Senator Lankford arranged for an American flag that was flown over the Capitol building to be presented to Neighbors. Jack Rogers, another SCM is a Vietnam veteran. He was wounded in Vietnam and had not seen a comrade of his since the war, the two were reunited during Worship over Washington. Lind and Swain agreed that one thing that became overwhelmingly noticeable was the warm reception the SCM, SCW and OBS received from strangers as they performed on the National Mall, in particular. “I have been to D.C. a few times, it’s a city that can by nature reject this type of environment, but what I have seen this week is that there is more of a balance in that narrative that is freedom of religious expression,” Lind said. “Particularly out on the mall, people stopped and listened and were very respectful. We played patriotic music, and people were engaged with that, with it being Memorial Day weekend, but when we got to the Gospel songs and some of the more traditional music, people were there and engaged in what we were doing,” Swain said. 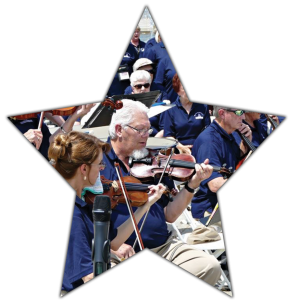 Members of the Oklahoma Baptist Symphony play the violin at an outdoor concert in Washington D.C. over Memorial Day weekend. Through lyrics, melodies and rhythms, the SCM, SCW and OBS were able to proclaim the Gospel and offer many worshipful experiences in Washington. Lind and Swain had a common goal for the trip, and that was that the name of Christ and Christians alike have a positive connotation in the Nation’s Capital. “Our folks are mission and Gospel-minded, but they also understand that the Gospel is a message of peace and love,” Lind said.